Water was nearly up to our waist in places but we didn't really feel the cold. Holly and Shel entering the narrows. I was nervous about being down in the canyon all day because I'm claustrophobic, but it was so beautiful and surreal I didn't even think about my fear. Early morning view on the Angel's Landing trail. An unexpected surprise on our Angel's Landing hike was seeing a pair of endangered California condors. They were catching thermals from the early morning sun on the cliffs -- and they soared just below us and right above us several times. They were so close in fact that we could see the radio transmitter on one of them and read the band on its leg. One of the condors is perched on the cliff above and behind me to the right, just a black dot in this photo. It was a once-in-a-lifetime sighting, something I'll never forget! 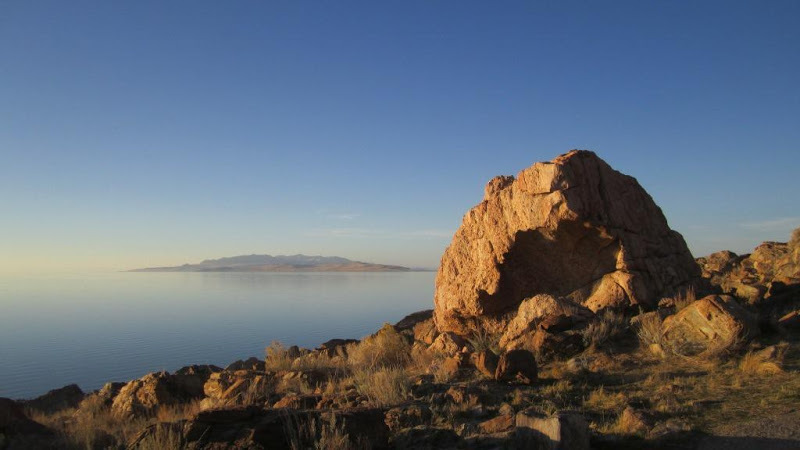 Great Salt Lake at sunset, photo from Antelope Island State Park.